According to a review of OB Rag records, there’s been an unprecedented sell-off of apartments in Ocean Beach over the last 4 years. This has included the transfer of nearly $38 millions and involving nearly 160 units. Since the summer of 2011, there’s been nearly 20 of these transactions – the sale and purchase of multiple-unit properties in the OB village. There’s been at least ten since January 2014 and 3 this year already. 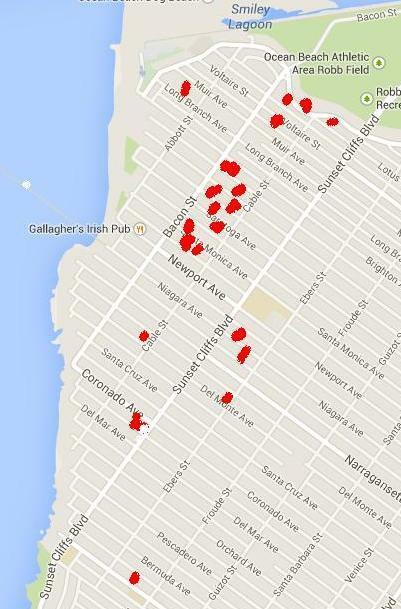 Rough map of multiple unit properties (n red) sold in OB over last 4 years. In particular, what’s been called “the War Zone” over the years – northwest Ocean Beach, has been especially busy. 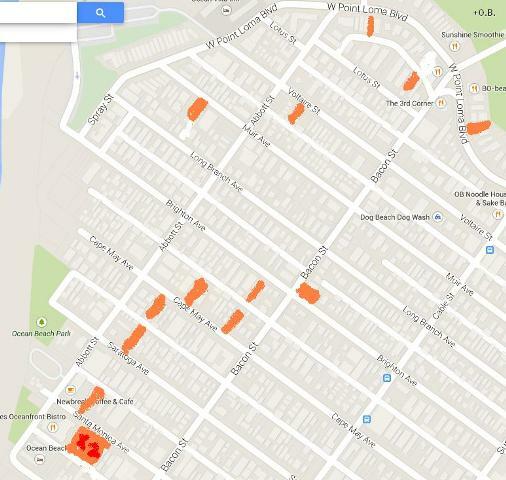 Sales of apartment properties in northwest OB (in orange)- rough estimates – not necessarily to scale. These transactions accounted for the transfer of close to $38 millions over this time, and included the sale and buying of 159 units. (No single house sale was counted and only sales of apartments within OB were included.) That’s a lot of moolah and that’s a lot of OB dirt. The scale of the sell-off is staggering when you step back and view the totality. It appears that capital that had languished during the Great Recession has now been released and apartment properties are being gobbled up. Combine this with the current building frenzy in and around Ocean Beach, you can get a sense of the enormity of the changes that our community is undergoing. And you get a sense of the millions that wealthy folks are making off the sands of Ocean Beach. Btw dear reader: this information and summary is not available anywhere else except in the OB Rag, as it’s not provided by the mainstream press or even by smaller papers like the Beacon. Isn’t this a darn good reason to sign up as a monthly donor to the OB Rag to ensure that it remains available in the future? this is not so surprising when you look at the amount of money that poured into rentals across the country , especially in CA and parts of FL. wall street has bet big on the fact that so many people lost their homes in the recession, and what I wonder is how much market collusion or manipulation can occur when a hedge fund owns a majority stake in the rental supply for a region? i suppose the same question can be asked of banks when they hold so many foreclosed properties ..
Low interest rates are good for both the buyers and sellers. And with the high cost to develop new properties (regulation, permits, raw land, etc), I would much rather buy existing properties. I think the lot with the liquor store at Abbott and Voltaire sold recently. Can you verify that? So Murfree Construction (located in a one-time mmj dispensary in PB) does not have plans to build three more “Famosa’s” on Voltaire? Seems clear enough that speculators are betting on O B and buying these properties as “bottom feeders”…noticing that we have a wonderful, friendly, beach front community which they hope will ultimately go totally upscale with rising rents. Your paypal link isn’t working for me. Sorry, I checked it, and seems to be okay. Well, I’m not sure that I’d exactly call the sales rate unprecedented – we’re looking at 18 buildings with 5 or more units (which is the dividing line between small buildings that could be potentially owner-occupied and strictly investor properties) sold in a little under 4 years – that’s 4-5 buildings a year. I went and looked at records for the last 10 years, from January 1, 2005 to date – 60 sales, or an average of 6 per year. That’s only including public sales through a real estate broker, often sales occur without public marketing, so I’m sure I missed a few. The Pat’s Liquor property has been in escrow with an asking price of $1,545,000 since late March – but it doesn’t show as having sold yet. Thanks Dave for your usual insight and knowledge of the trade. However, viewed another way: 159 units divided by 4 years = almost 40 units per year. Part of my point is the increase just in the last couple years as the recession has ebbed. Of course if you include those years during the recession that didn’t see many sales, then the ratio goes down. But that partly misses the point. Phillis and Kermit Keen probably held a good portion of the properties that you mention as having being sold over the past few years. If so, I’d say its no biggie: They bought, improved and held properties for decades. Whomever is liquidating the properties is merely releasing properties back to the market.